I ran supervised admixture on the Yunusbayev et al dataset from the Caucasus using my reference 3 data to see how the Yunusbayev samples looked in my Ref3 admixture component space. Here's the spreadsheet for Yunusbayev admixture results. You can compare with the reference 3 results. Here's our bar chart for Yunusbayev results. Remember you can click on the legend or the table headers to sort. 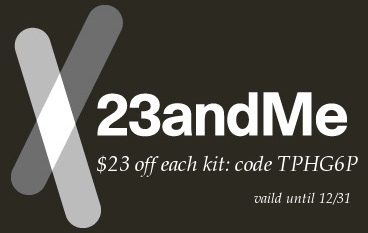 23andme is having another sale till December 31: $23 off per kit (from $99 up front). The code to take advantage of the sale price is TPHG6P. UPDATE: Here is another link for a $23 discount for 23andme. I ran supervised admixture on the Metspalu et al dataset using my reference 3 data. Here's the spreadsheet for Metspalu admixture results. You can compare with the reference 3 results. Here's our bar chart for Metspalu results. Remember you can click on the legend or the table headers to sort. These are very different from Dienekes for some reason. UPDATE (Dec 13 10:04am): I found a major error. I had used the population info file I had downloaded from the paper instead of my reformatted one and thus I had not merged that info with the correct IDs with the admixture results. So the previously posted results were junk. I have fixed that now and the results are as expected. South Asia harbors one of the highest levels genetic diversity in Eurasia, which could be interpreted as a result of its long-term large effective population size and of admixture during its complex demographic history. In contrast to Pakistani populations, populations of Indian origin have been underrepresented in previous genomic scans of positive selection and population structure. Here we report data for more than 600,000 SNP markers genotyped in 142 samples from 30 ethnic groups in India. Combining our results with other available genome-wide data, we show that Indian populations are characterized by two major ancestry components, one of which is spread at comparable frequency and haplotype diversity in populations of South and West Asia and the Caucasus. The second component is more restricted to South Asia and accounts for more than 50% of the ancestry in Indian populations. Haplotype diversity associated with these South Asian ancestry components is significantly higher than that of the components dominating the West Eurasian ancestry palette. Modeling of the observed haplotype diversities suggests that both Indian ancestry components are older than the purported Indo-Aryan invasion 3,500 YBP. Consistent with the results of pairwise genetic distances among world regions, Indians share more ancestry signals with West than with East Eurasians. 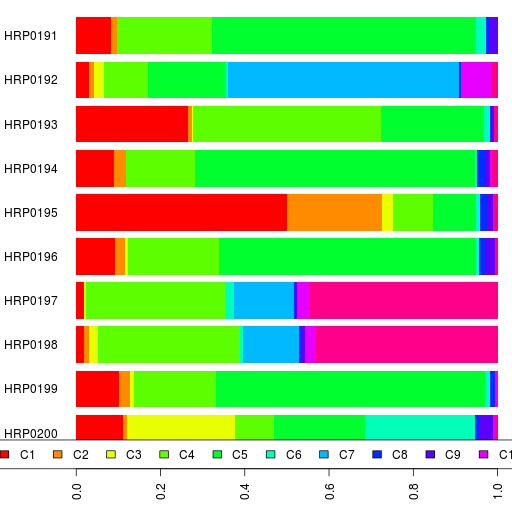 However, compared to Pakistani populations, a higher proportion of their genes show regionally specific signals of high haplotype homozygosity. Among such candidates of positive selection in India are MSTN and DOK5, both of which have potential implications in lipid metabolism and the etiology of type 2 diabetes. I'll have some comments later today.